This anxiety-free environment is achieved by additions to the waiting room such as massage chairs, relaxing music and a waterfall fountain on one wall. Heritage Dental also offers paraffin wax hand treatments, neck warmers, blankets and pillows for comfort during dental procedures and flat-screen TVs attached to the dental chair. “When patients come here, they will not feel any discomfort,” assures Skovron. Every step of each visit is designed to do the best job possible so that patients feel no anxiety or pain. For those who still have dental fear despite all of these measures, Heritage Dental offers conscious sedation—medications absorbed under the tongue, to take the edge off for several hours. This method is inexpensive, requires no tubes or needles and has an amnesiac effect—patients rarely remember the procedure the next day. Despite all of the new technology and extras that create such a relaxing spa atmosphere, Skovron is an in-network provider. “Everyone once in a while, people walk in here and say ‘I probably can’t afford this,’” she says. Skovron assures that she goes by in-network fees and there are no extra charges at her office compared to a standard dental office. The ideal client for Skovron is “someone who appreciates the atmosphere we’ve created here and takes a real interest in their health. I get so excited when my patients participate in things like looking at their 3-D scan and playing an active role in planning for their health.” Skovron’s office treats patients of all ages and offers a variety of procedures, including some more often seen at an orthodontist or oral surgeon’s practice. Whether it’s for oral surgery, implants, 3-D X-rays or a regular cleaning, a visit to Skovron’s office erases the worries of dental discomfort. “I don’t know that I can make everybody want to come here over a day at the beach, but I can make it a less stressful event, and that was my goal,” she smiles. For more information about Dr. Beth Skovron and Heritage Dental, call 215-822-3860 or visit HeritageDentalDDS.com. 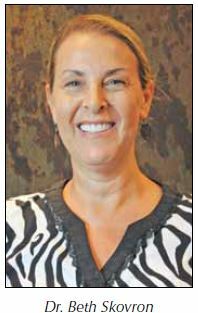 Michelle Bense is managing editor of Natural Awakenings BuxMont. Connect with her at Hello@NABuxMont.com. Alyssa Capel is a contributing writer and editor for Natural Awakenings BuxMont. October 2014. This entry was posted in Community Spotlight, DEPARTMENTS, Local Articles and tagged alyssa capel, business spotlight, community spotlight, dentist, dr. beth skovron, michelle bense, october 2014, spa, spa dentist by Healthy Living Bucks and Montgomery Counties. Bookmark the permalink.